Modern war is a high-tech affair, but in World War II, soldiers relied on a kind of support used since ancient times. Dogs, horses, and pigeons became soldiers’ best friends, serving to carry weapons, wounded men, and messages through artillery fire. 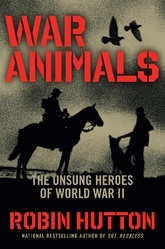 In War Animals, the bestselling author of Sgt. Reckless brings these animal heroes to life with the stories of pigeon G.I. Joe, who saved an Italian village and British troops by carrying a message to Allied forces; Chips, a German Shepherd who attacked an Italian machine gun team and saved his handler's life; and Bing, a paradog who jumped out of a plane on D-Day and helped his handlers locate the enemy. Here is a heartwarming history of bonafide heroes of feather and fur.